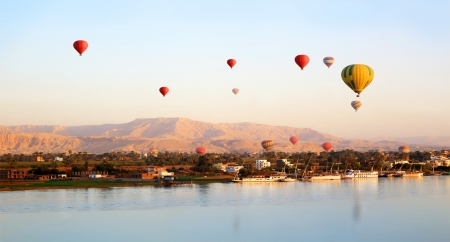 Enjoy an adventure in the early morning in breathtaking hot air balloons rides over Luxor for 45 minutes floating over some of the world's most important archaeological sites, including the Valley of the Kings and Queens, and iconic historic monuments. During the flight over Luxor you get breathtaking views of the sprawling temples of Karnak and Luxor Temples along with the green lush Nile delta and farmlands. Includes refreshments.